Be "Dressed to Grill" at your next BBQ event. When the grill is not in use, put on the Cowhide cover and "Tie the beast" to the railing on the deck. Have fun with family and friends as you make the ultimate BBQ statement. 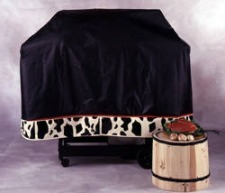 Only with the Cowhide Grillfitti grill cover. Black body, cowhide print trim, red accent, The Cowhide is everything to Moo about! Note: The Cowhide in Extra-large size is no longer available. The medium and large size are still available as shown.